ways in which the SMS can improve. Furthermore, safety auditors provide oversight to ensure regulatory and contractual obligations are fulfilled. This oversight is one method of data collection in an SMS' Safety Assurance (SA) component. Aviation safety auditors have a very hard job for several different reasons. Safety auditors are not universally welcomed. The word safety audit is in much of the aviation safety industry a word you don’t use lightly and is a word one compelled to speak in a whisper or raised upper lip. While I am being facetious, it's no secret that auditors are often seen as the people who are trying to “find out” what an organization is doing "wrong." An auditor walking around wielding an auditing checklist can be mildly disconcerting or downright nerve-wracking. Because of this, it’s not uncommon for safety auditors to face passive resistance or reticence from employees who may be afraid of incriminating their organization or don't fully understand the basics of safety audits. It’s a paradoxical mix of traits. Different auditors will obviously have some skills that they are better at. However, there three traits I have found universally that good auditors have. This is a biggy. The more evidence an auditor has about an SMS – its documents, its personnel, its information flow – the better judgment he will be able to make about any piece and the overall health of the aviation SMS. This means not they don’t simply “take someone’s word for it”. They physically check records and documentation. They observe the organizations physical environment. They get input from many different sources to piece together a well-informed, more objective opinion. It also gives them more opportunities to identify issues. Appropriate not only means the channels that the particular SMS has designed, but that those channels are efficient. The most appropriate flow of safety information may not be incorporated into an organizations practice. Moreover, successful auditors continue to pick up more useful methods for gathering the best, most comprehensive evidence. The pitfall of any complex system is to get lost in the minutia, stuck on individual pieces, and lose focus of the whole. We can describe good aviation SMS auditors as top-down thinkers. First, by understanding an organization's overall structure and then seeing how each part of the extensive audit form fit in with the overall structure’s effectiveness, much as mechanic things about an engine. Having the ability to think both big and small allows auditors to correctly identify the deficiencies in an aviation SMS. That’s why sound communication is an extremely important part of an auditor’s job. He/she not only needs to be fair with audit but must also appear reasonable as well. Good communication skill help establish the auditor as a helper rather than someone simply looking for mistakes. Good aviation SMS auditors are adept at making an organization feel “helped” rather than “criticized.” Demeanor – or trying to come off a certain way – plays a very little role in an auditor's success at achieving “helper” status. 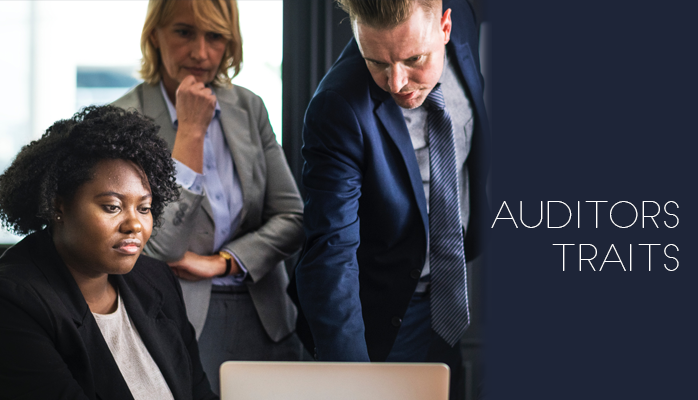 I consider a fourth, somewhat informal trait that all good auditors have is that they walk into audits with a "helper" mindset - that is, they work from a position of supporting improvement rather than simply assessing how compliant an organization is. Are you ready for your next safety audit? Do you have auditing tools? Do you need an efficient process to audit vendors and internal processes? Do you need a process to manage findings and track corrective and preventive actions? Do you need a Web based auditing system? Here is a low-cost affordable auditing system. Also, here are several useful safety audit checklists.